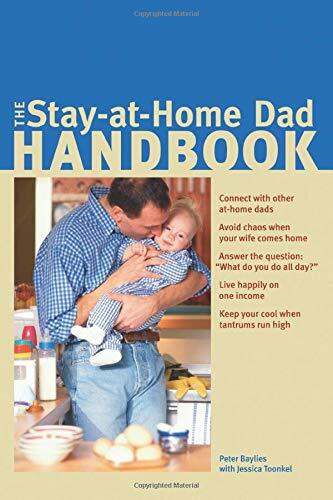 I’ve just finished reading Peter Baylies’ The Stay-at-Home Dad Handbook. Like every book on fathering, this one’s fairly hit and miss in terms of what I found most useful. Baylies largely treats fathering as a ‘career move’, and the book is shaped to that end – that is, helping fathers enjoy their ‘new career’. While it’s not the way that I like to think of fathering, there are strengths in this (that will no doubt appeal to other personality types), such as helping new father’s approach their responsibilities thoughtfully, purposely and seriously. Adversely, although the book is clearly set out, and somewhat ‘practical’ (including a somewhat useful appendix of resources), it often lacks the personal warmth, and focus on the parent-child relationship, of many parenting books. Whether it is just cultural or personality or values (and I suspect it’s all three and more), I found Baylies’ book just too basic. Although much of the ground that he covers is useful (the section on playgroups and networking with others for example), it is difficult to believe that most fathers have not thought through most, if not all, of the issues he raises. If you’re after a ‘Fathering 101’ handbook, this one may well be what you are looking for, though it wouldn’t be my first choice. If you feel that you could skip ‘Fathering 101′ and move up a grade or two, you would be better served to look elsewhere. One of the strengths of the book, however, is that Baylies has clearly spent much time listening to other fathers. Although at times I was left wondering if he has spent too much time doing this – as the inclusion of copious fathering stories betrays – it does give the book a sort of common-sense, communal wisdom (or ignorance?) feel. Of course, it’s easy enough to navigate your way around the material and jump to the next section if you want. 1. Talk to them and listen to them. When your kids know you are listening to them, it makes them realize their input matters, and gives them a feeling of control and self-worth. 2. Treat them with respect. When you respect them, they will respect you back. 3. Give a lot of hugs and kisses. A feeling of being loved gives your kids a feeling of self-confidence. 4. Show you love your spouse in front of your kids. Seeing Mum and Dad show affection toward each other gives them two role models. 6. Communicate with your spouse and agree on parenting styles. To avoid a public argument and mixed messages, make sure you and your wife agree on your children’s behavior. 7. Get to know your kids’ friends. As your children get older and a few neighborhood kids start to visit, listen to them and learn what they are like and how mature they are. This will give you better judgment when they start asking to do more outside the house. them make a better decision next time. But if you have a serious issue, stand by it. 9. Avoid yelling at them at all costs. Always discipline with reason, not fear. When you don’t like a decision or action your children are making, calmly ask them why they are making the decision. Have them explain what might happen; sometimes they will see why you might be right. 10. Create as much adventure as possible for your kids. Creating adventure, although it may not be a popular pastime for the mums, is one way that many at-home dads deal with burnout. This does not mean taking the kids skydiving or white water rafting. It is amazing what adventures you can find within a few blocks of your house. In fact, many dads find that every time they take their children out of the house it can be an adventure.